Budgam, February 08 (Scoop News)- District Development Commissioner Budgam, Dr Syed Sehrish Asgar today expressed her gratitude to Hon’ ble Governor J&K Satya Pal Malik, Advisor to Governor, Khurshid Ahmad Ganai, Chief Secretary BVR Subrahmanyam and Divisional Commissioner Kashmir Baseer Ahmad Khan for helping the district administration in arranging two sorties for GATE aspirants to enable them to reach their examination venues in Jammu and Delhi. 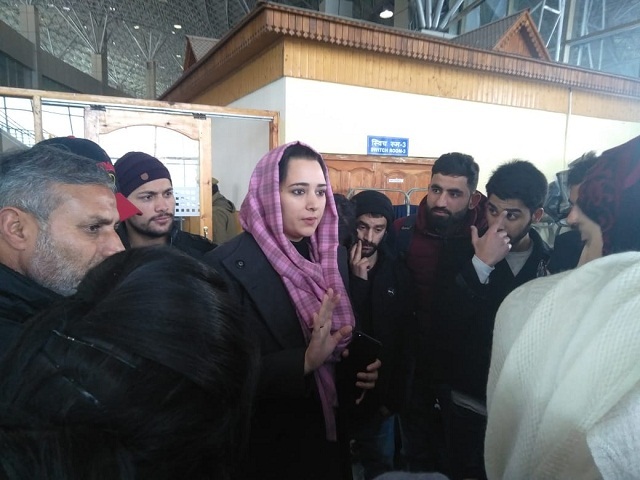 The DDC who visited the Srinagar International Airport today afternoon, facilitated the travel of around 360 stranded aspirants appearing in the GATE examination to be held on February - 9th and 10th. She said that it is first of its kind that sorties were arranged for the aspirants who could not travel to their respective places of examinations centers for closure of both surface and air links due to the continuous snowfall in the valley from past few days. She said that District Administration took strenuous efforts in informing the aspirants, registering them and arranging passes for them to facilitate and ensure all the aspirants appearing in examination on nearing dates reach to the venues of the examination centers well before the time. The DC interacted with the aspirants and assured all possible help to them on the occasion. Meanwhile, aspirants too expressed their gratitude to the Governor Administration particularly to the DDC Budgam for taking pains in resolving the issue on war footing basis.